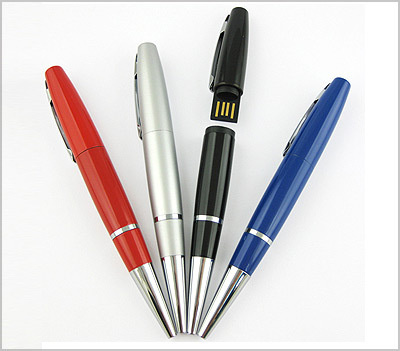 At first glance the F-232 looks like your standard pen; however, beneath the cap reveals a USB flash drive. Inches: 5.23" x 0.66" x 0.55"
System Requirements Windows 95 and above, Mac OS 8.6 and above, Linux. Power No external power required. Artwork Guidelines: All artwork must be vector based and provided in one of the following file formats: EPS, Al, or Vector PDF. The packaging list below shows all compatible packaging options that can be included with this model. A White Tuck Box provides a simple yet affordable way to distribute your branded flash drives; giving it that little extra touch. Note: Box size varies to accommodate the selected flash drive. Pricing below is in the column. Our premium packaging option, the Tin Gift Box is a great choice when wanting to showcase your flash drive as well as your brand. Features a display window making your logo always visible. Note: This item is NOT sold seperately. Pricing below is in the column. The cellophane bag is our FREE default packaging for all our USB flash drives. Packaged in a self-sealing cellophane bag helps to protect each drive as well as your logo from rubbing and potential damage during transport. Note: This item is also sold seperately, see pricing tab below. Pricing is in the column. We can preload presentations, product catalogues or any other promotional materials you desire. Whether it is to supply important data to your clients or just to reinforce your company message, preloading your custom USB Flash Drives with data is an excellent concept. A Flash Drive is purely a data storage device so we can preload any type of data. IMPORTANT: Please ensure that your preload has been thoroughly tested. We do not test or validate the data in any way; we simple preload what we have received. When a preload is received we will forward you a screenshot for your approval indicating the total number of files as well as the aggregate file size of your preload. In addition, you will be sent a link that will allow you download a zipped document containing your entire preload; should you wish to review before being sent into production. Protect your preloaded data from accidental deletion with our partition service. We will divide your drive into two areas ("partitions") - one for your data, and one for your end user's files. Data preloaded in a separate partition cannot be erased even if the drive is formatted. When you insert the Flash Drive into your USB port, 2 drive icons will appear: one contains the preloaded content and the other partition acts as a standard removable flash drive (user area). Customize your USB Flash Drive's standard OS icon with your company imagery. Custom Icons makes a lasting visual impression whenever a user plugs in your USB Flash Drive. In addition, you may also provide a textual label, not to exceed 11 characters, that will be displayed along side your customized drive icon. The customized USB appears with this name when plugged into a computer: a small but noticeable touch. Note: Drive icon must be provided in an ICO format with a pixel size of 48 x 48. Drive label cannot exceed 11 characters.